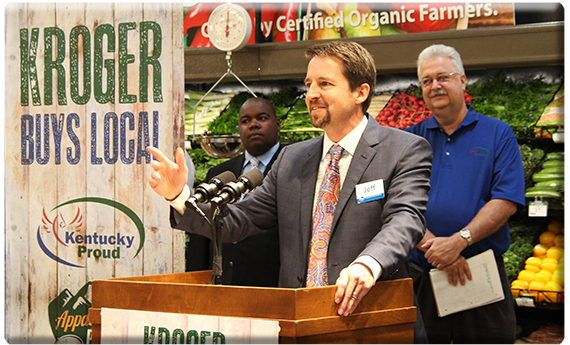 FLORENCE, Ky. – Kroger will add dozens of Kentucky Proud items in its northern Kentucky supermarkets, expanding a partnership of the national chain and Kentucky’s official farm marketing program, officials with Kroger and the Kentucky Department of Agriculture announced today. In a news conference at the Kroger Florence Marketplace, officials announced that 16 northern Kentucky supermarkets will be stocked with 58 new Kentucky Proud items from 24 vendors, including four from northern Kentucky. The first week’s order will total $50,000. The items will appear in a special Kentucky Proud kiosk in each store. Fishmarket Seafood, a family-owned distributor in Louisville, will distribute the products to the Kroger stores. The announcement follows up on the record-setting launch in November 2014 of 125 Kentucky Proud products in 88 Kentucky stores in Kroger’s Louisville division. The initial purchase filled a 10,000-square-foot warehouse and totaled $350,000, a record for a single transaction in the history of Kentucky Proud. To find out more about the Kroger-Kentucky Proud partnership, go to www.kyproud.com/kroger.